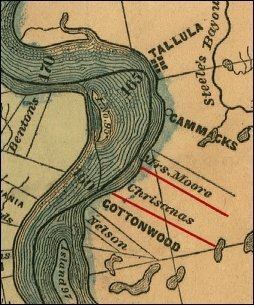 Richard Christmas was an extensive landowner in Issaquena County during antebellum times. His plantation, Shiloh, was located on the Mississippi River south of Tallula, the county seat of government at that time. Richard Christmas was a wealthy man of his times owning thousands of acres of land throughout Mississippi in the counties of Humphries, Washington, Madison, Hinds and Lowndes. 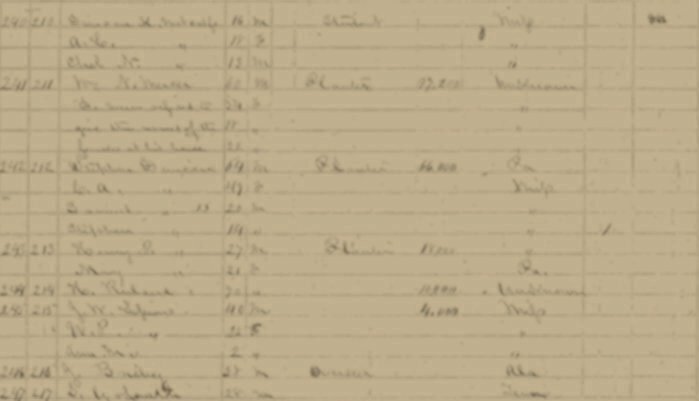 The 1860 Issaquena County Federal Census shows the value of his Issaquena property at $390,000, which today, would be nearly $8 million dollars. The 1860 slaves schedules show that his Issaquena County plantation was home to 166 slaves and the plantation consisted of sixty slave houses. Christmas and his wife also built a summer home, Ashlawn, (Adobe® PDF format, 197 kb) in Williamson County, Tennessee, south of Nashville. He was a person of great wealth and impeccable taste. There are legends of his great coach drawn by six matching horses, of his fine clothes and urbane manners. During 1835 the Tennessee State Legislature appointed him to the Board of Trustees of the Franklin Female Academy in Williamson County. Ashlawn, the Tennessee summer home, which is still standing, was built with meticulous attention to detail. Walls of handmade brick are 13 inches thick and all rooms are 20 x 20 with 13 foot ceilings. The stone veranda, columns, and mantels are from limestone quarried on location, as is a cellar lined with limestone. Doors are pegged and many have the original hardware. The woodwork is yellow poplar except for the downstairs hall floor, which is white ash. Both the handrail and spindles of the staircase are made of cherry. In the entrance hall is a curved wall and winding staircase that rises to the third floor. Richard Christmas was born in Warrenton, North Carolina during 1805, one of three children of Thomas Christmas and Mary Ann Hilliard. Thomas and Mary Hilliard's other children were Thomas Hilliam (born ca. 1800) and Henry (born 1810). Richard married Mary Emaline Smith (daughter of Alexander and Sarah Jane Leiper Smith, a granddaughter of Captain James Leiper, an early settler of the Nashville, Tennessee area) on September 12, 1832 in St. Paul's Episcopal Church, Wlliamson County, Tennessee. To this union were born three children: William Hardeman (born after 1833 in Mississippi, died before 1897 in San Francisco, California); Richard (born during 1835 and died August 8, 1837 in Williamson County, Tennessee) and Henry Hill (born on December 25, 1840 in Madison County, Mississippi and died about 1868 in Issaquena County). Mary Emeline Smith Christmas died on January 22, 1842 at the age of 27 as a result of a steamboat accident on the Mississippi River. After the death of his first wife, Richard Christmas married Mary Elizabeth Phillips on October 7, 1852 at the Episcopal church in Louisville, Kentucky. Of this union were born two children: Norma H. (born July 6, 1855 near Louisville, Kentucky) and Richard (born August 20, 1859 on Shiloh Plantation in Issaquena County). Richard Christmas' brothers also came to Mississippi and became very successful in planting. Thomas Hilliam was a planter in Bolivar County, where he died February 28, 1859 and Henry, also known as Harry. Henry first came to Madison County and later moved to Bolivar County, where he was an extensive planter. Henry was killed in a steamboat explosion in 1850, when only about forty years of age. He was married in Jefferson County to Anna Dixon, daughter of Rodger Dixon, who was born in Mississippi, but who was of English parentage. The gradfather Dixon was a soldier in the English army and was knighted for gallantry and deeds of daring on the battlefield. Richard Christmas died in Mississippi during 1878, probably as a result of the great yellow fever epidemic of 1878 that devastated parts of Mississippi, Louisiana and Alabama. He was buried in Williamson County, Tennessee. After the death of Richard, his widow, Mary Elizabeth and youngest daughter, Norma H. lived in New Orleans, Washington DC, San Francisco and New York City. They also spent considerable time in Europe. The 1880 US Federal Census shows them staying at the Victoria Hotel on Broadway in New York City. On March 17, 1886, Norma H. married the Marquis Suarez d'Aulan in Paris. New York, April 8 -- A brilliant foreign wedding which took place at Paris on the 17th of last month and in which a former resident of Washington was one of the contracting parties, is the topic of conversation in Fifth Avenue circles were on account of the reported magnificance of the nuptial ceremonies and the excellent parti secured by the bride. The lady is Miss Norma Christmas, daughter of Mrs. Richard Christmas, celebrated some years ago at the Capital and throughout the South for her beauty and hospitality. Mrs. and Miss Christmas have been living for several years on the Continent. The groom is the Marquis Suarez d'Aulan, a member in 1876 of the Corps Legislatif and a retired army officer of distinguished ancestry. Moran Suarez, from which he is directly descended, was one of forty chevaliers who captured the city of Xores, on the Maures, in 1266. The Marquis and the American Marquise d'Aulan will reside during the summer upon the bridegroom's estate, at the Chateau d'Aulan, in the Department of Drome, in Southern France, and in the winter season will occupy the Marquis' elegant town residence in the fashionable precincts of the French capital. Entire Contents Copyright © 2003, 2004 Bob Franks.